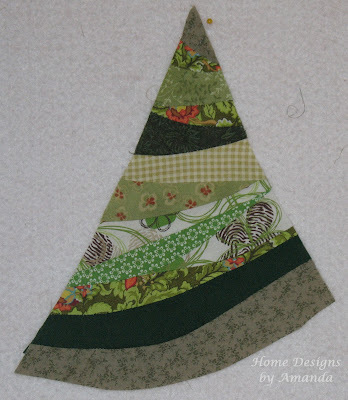 The plan was to have a quick dinner then sew up my O Christmas Tree mini quilt for Curves Class. The quick dinner did happen and we played two quick hands of No Thanks! A new card game we got during our trip last weekend. We were done and cleaned up by 6 pm....yeah, I thought, I can sew all evening - DIDN'T happen! I did start pulling out green scraps for the tree, then Chad had problems with the printer, so I had to find out what was wrong there...needed new ink, then the new cartridge didn't work, so now I have to call Clickinks and get a replacement! I did have another new one that worked, so Chad got what he needed, but it still an annoyance when we have a defunct cartridge in our order! Moving along in the evening, I did a little more fabric choosing...then a cranky baby wanted to eat, but didn't want to go to bed at bed time! Eventually, she did settle down, I put her in her crib and played the piano to get her to sleep...it worked and I got my practicing in! Ahhh, but I was suppose to be sewing! About 11:30 pm I was done with my tree. I don't know that it was suppose to take that long, but I did have a few problem areas when making my tree...just worked through them and finished with this. I'll be adding the background to my tree, probably today. Hope everyone else had a more 'sew'ficient FNSI! I still did have a lot of sewing time in yesterday, but typically I do tend to be more productive in the afternoon and late evening than during late afternoon/early evening. This is another favorite passage, and it also speaks of the tree being rooted by the water. It gives me a picture of how we are to be rooted to God and He will sustain us, even in the rough and uncertain times. I'm so thankful to have faith that He will accomplish all thing for good and to His will, if we just seek Him.